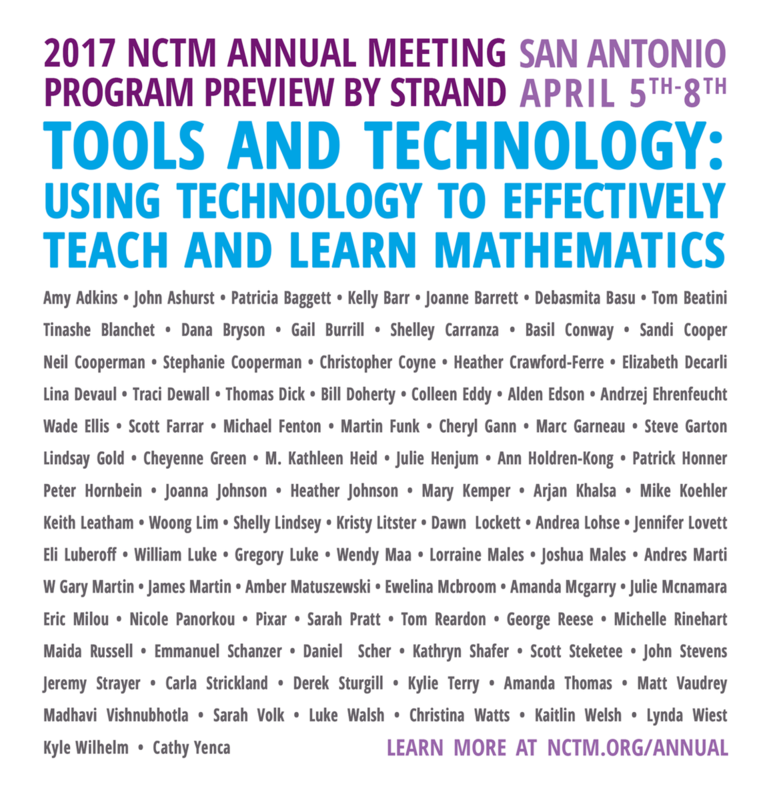 January 20: A promotional image for speakers in the tools and technology strand got a lot of retweets and send people to the page for the NCTM 2017 Annual Meeting. January 21: People in the math education community were sharing the NY Times gallery of "Pictures From Women's Marches Around the United States and the World." January 22: As you might expect, estimation exercises in the news get the attention of math teachers. People shared the NY Times article, "Crowd Scientists Say Women's March in Washington Had 3 Times More People Than Trump's Inauguration." January 23: Lara Pudwell wrote on the AMS Blog, "What is an Experimental Math Course and Why Should We Care?" She advises that experimental courses should focus on the approach to mathematics and be flexible with the content. January 24: Robert Kaplinsky has been posting about Depth of Knowledge lately, something I've been studying up on myself. Here Robert uses sets of examples to illustrate what different DOK levels look like at the elementary level. January 25: Concerns about the role of science in a new presidential administration had people sharing "Thanks to Trump, Scientists Are Planning To Run For Office." 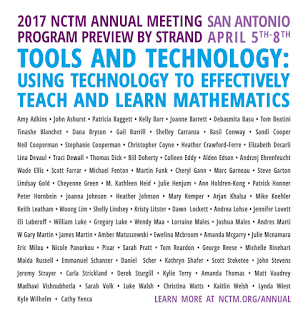 January 26: People were buzzing about the NCTM Ignite lineup. Are you a college instructor wanting to know more about inquiry based learning? You might want to check out these IBL summer workshops at DePaul, Cal Poly, and Nazareth College. I'm not interested in sharing information about every math-related webinar and MOOC, but the set of offerings from the Place @ the Friday Institute has a set of courses designed specifically for math teachers and their courses are beginning now. I'm having trouble with the Global Math Department conferences on BigMarker right now, but trust me, they're still hammering out the dents in math ed every Tuesday night. 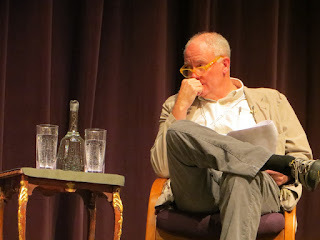 To save myself a little time in the research notes, I may not always list the institution of each author. Some journals make it near-impossible to copy and paste this from the article page — looking at you, Taylor & Francis! The Winter 2017 issue of the Colorado Mathematics Teacher is available for all to read. To support the CMT and the work of CCTM, become a member. The next meeting of the Colorado Metropolitan Math Intervention Team (CoMMIT) will be held Friday, February 3 from 8:30 to noon in the Littleton Public Schools board room (5776 S. Crocker St., Littleton). The featured speakers will be Doug Clements and Julie Sarama of the University of Denver. The next meeting of the Colorado Mathematics Leaders will be Monday, February 6th in Jeffco. Stay tuned to the CML listserv for details. The first monthly informational webinar about the review of the Colorado Academic Standards will be Tuesday, February 7, from 3:30 to 4:30. Connection information can be found on the CDE website. CDE continues to collect standard-specific feedback using an online standards feedback system. This is a unique opportunity for any Coloradan to provide line-by-line recommendations that will be considered by the standards review committees. All forms of feedback are welcome: if you think something should stay as-is, be revised for clarity, moved to another grade, or removed altogether. Do not let this opportunity pass if you have ideas that you think should be considered! The online standards feedback system will be open through Sunday, April 30, 2017. This end date has been extended again because your input is so critical to the review and revision process. CDE's Educator Effectiveness unit is collecting public feedback about its teacher rubric. See here for dates and locations of focus groups (must register by 2/24) and an online form to submit specific feedback about the rubric. Monday, January 30th is the deadline to register 9th-12th grade girls for the Girls Lead the Way Leadership Conference. The conference is February 11 at the Colorado School of Mines in Golden.